Methods: We conducted a narrative literature search including clinical trials, experimental studies on laboratory animals and cell lines. Our search covered Medline, PubMed and Google Scholar databases from 1999 until 2018. We used the terms” Metformin; Rheumatoid arthritis; Cardiovascular disease; Cancer; Osteoblastogenesis. Discussion: Inflammatory pro-cytokines such as Interlukin-6 play important roles in T. helper 17 cell lineage differentiation. Interlukin-6 and Tumor Necrosis Factor-α activate Janus kinase receptors signal through signaling transducer and activator of transcription signaling pathway which plays important role in inflammation, bone destruction and cancer in rheumatoid arthritis patients. Interlukin-6 and Tumor Necrosis Factor-α synergistically activate signaling transducer and activator of transcription and Nuclear Factor-kβ pathways and both cytokines increase the chance of cancer development in rheumatoid arthritis patients. Metformin is AMPK activators that can suppress mTOR, STAT3 and HIF-1 so AMPK activation plays important role in suppressing inflammation and osteoclastogenesis and decreasing cancer. 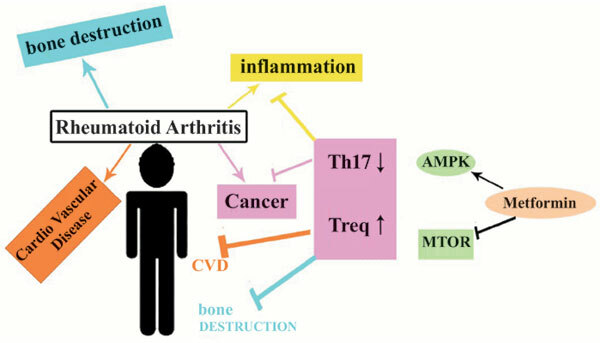 Conclusion: Metformin effect on AMPK and mTOR pathways gives the capability to change Treg/Th17 balance and decrease Th17 differentiation and inflammation, osteoclastogenesis and cancers in RA patients. Metformin can be useful in protecting bones especially in first stages of RA and it can decrease inflammation, CVD and cancer in RA patients so Metformin beside DAMARs can be useful in increasing RA patients’ life quality with less harm and cost. Metformin, rheumatoid arthritis, cardiovascular disease, cancer, osteoblastogenesis, medicines.